As they promised last year, in April the World Health Organization (WHO) and its regional counterpart, the Pan American Health Organization (PAHO), celebrated World Health Day in April by trying to educate us all about the possible health impacts of global climate change on health. Most assessments and discussions of climate change to date have focused more on the environmental and macroeconomic impacts of global climate change. The possible/probable health impacts are less well understood but no less important, particularly for Latin America and the Caribbean (LAC). 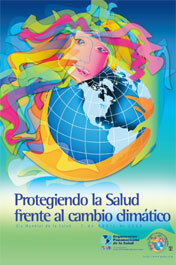 WHO and PAHO are not new to this issue. 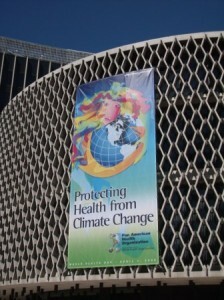 WHO has issued several documents on the issue in recent years, including a major 2003 report, a 2005 “fact sheet” on climate and health, a March 2007 article on the topic in the Bulletin of the WHO, and a May 2007 article by WHO experts on the urban dimension in the Journal of Urban Health. WHO also had a major role in putting together the human health chapter of the latest (fourth) Intergovernmental Panel on Climate Change (IPCC) assessment report. Climate change impacts on health both directly – for example through heat waves, floods and storms and other extreme weather events, but also indirectly, through effects on infectious disease, on water availability, and on agricultural production. These are not minor issues. Diseases that are sensitive to climate include some of our biggest killers as malaria, diarrhea, and including risk conditions such as under-nutrition, the single largest contributor to the global burden of disease. These are also diseases of children and diseases of poverty. Indeed, when it comes to climate change, those whose health is most at risk are those who have contributed least to the problem. The poor, whether rural or urban, have always suffered more the consequences of a degraded environment. Lack of safe food and water has resulted in diarrheal diseases in children and malnutrition in the longer term. Climate change now threatens to perpetuate these problems. 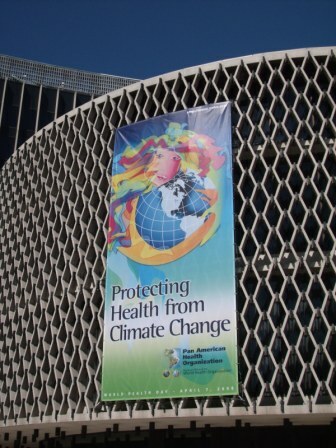 As part of its World Health Day initiative on this subject, PAHO issued an updated version (to reflect new data and the IPCC assessment) of the executive summary for WHO’s 2003 report on climate change and health. 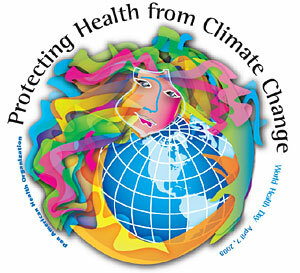 The adverse health impacts of climate change can be both direct and indirect. Direct effects result from from climatic extremes such as thermal stress and weather disasters. Indirect effects result from climatic influences on vector-borne disease transmission, water- and food-borne disease transmission, and food and water security. Indirect effects also include the consequences of social and economic dislocation, including population displacement. In the Americas, the major areas of concern are increases in extreme weather events, changes in food supply and nutritional security, changes in water supply, changes in vector-borne disease range and distribution, and rising sea levels. Due to rapid urbanization in the Americas, urban health issues will become increasingly important. The vulnerability of a population and its capacity to respond to new conditions influences the gravity of the impacts. Effectively targeting prevention or adaptation strategies requires identifying where populations are not able to cope with the effects of climate variability and extremes, such as floods, droughts, and heat waves. The most vulnerable groups include children under 5, pregnant and lactating women, older adults, marginalized rural and urban populations, indigenous populations, and displaced populations. Vulnerability can be exacerbated by other stressors, such as poverty, food insecurity, conflict, and disease. What are the options for response? Societies can actively respond to climate change in two ways: through mitigation and adaptation. Mitigation aims to reduce, delay, or avoid impacts through interventions that reduce the sources of greenhouse gases or that enhance gas-absorbing “sinks.” In public health, this corresponds to primary prevention, which aims to prevent the onset of injury or illness. Adaptation is defined as an adjustment in the natural or human system in response to changes produced by climatic stimuli. Mitigation and adaptation must occur in civil society, industry, government, and other sectors and must be done in an intercultural way and by increasing citizen awareness. There are many co-benefits and synergies that can be obtained from climate-sensitive choices. For example, walking, cycling, and using mass transportation can reduce not only greenhouse gas emissions but also obesity and osteoporosis, depression and social isolation, and the health effects of air pollution. Understanding these co-benefits —- and the positive economic impact small changes can have on the individual —- is important for stimulating change. However, as the updated executive summary makes clear, we only have a bare-boned outline of probable health impacts that needs to be fleshed out. There have been very few health impact assessments (HIA) for climate change undertaken by nations, and most of these have been for OECD nations rather than developing nations (such as LAC), with varying criteria and degrees of quality, and little substantive discussion of (1) the adaptive capacities of the population under study; (2) the policy options for minimizing the health risks identified; (3) the degree of confidence/uncertainty associated with the various elements of the estimates. While WHO and PAHO suggest that general guidelines for HIA be developed, but to be adjusted to reflect regional (suggesting perhaps that PAHO create a set for the Americas?) and national priorities. They also recommend that, unlike some HIAs already concluded, the process of drafting the assessment be inclusive, involving all key stakeholders — as a way to educate everyone on climate change risks, build consensus and sensitize policymakers to issues and angles that they might not otherwise consider. Last but not least, they call for HIAs to (1) identify information gaps that should be the priority targets for follow-up research; (2) link to follow-up activities, particularly monitoring of key indicators and early warning markers. The revised executive summary also points out the substantial data needs — both for a better understanding of probable health impacts yet to come, and for monitoring the evolving health impacts (click on chart at right to see expected data needs) and the attempts to minimize their impacts. For example, more complete and consistent reporting is needed of extreme weather events across LAC (not just in a few countries, as is now the case), along with some standardization of how they are reported and attributed. Another example: while many LAC nations have relatively good data sets on temperature and morbidity/mortality trends, few assessments have been made to match these against key social and environmental factors to identify with greater certainty who might be particularly vulnerable. A third example: while we can guess with reasonable certainty that climate changes will affect the spread of vector-borne diseases such as malaria, dengue and Chagas, a clearer picture is needed by better monitoring of shifts in the distribution and spread of these diseases and how they match against such factors as land use, host abundance, altitude and climate-linked changes in rainfall and water supply. The educational effort linked to this year’s World Health Day, and the handful of studies and articles that preceded it, are decent first steps. But it’s time to go beyond that, since the stakes represented by potential health impacts are too great to take a back seat any longer in the assessments and debates of climate change. LAC governments, prodded, shepherded and assisted by PAHO, need to agree on proper frameworks and standards for conducting HIAs of global climate change, and then to actually launch the processes (preferably inclusive of all key stakeholders) for drafting the HIAs. And frankly, it needs to be done by more than just the big nations (Brazil, Mexico) and a handful of the smaller South American nations. Something must be done to ensure that the Caribbean island nations, Central American nations and poorer South American nations (Bolivia, Guyana, Paraguay, Suriname) also can and will conduct proper HIAs. Many of these will are likely to be hardest hit (at least in relative terms) by the health impacts of global climate change. All this will of course require funds, but given the growing number of funding sources for all work related to climate change, and the past vocal support of multilateral (UNDP, World Bank, IDB) and bilateral (DANIDA, SIDA, AECI, CIDA and even USAID) sources for health issues in LAC, finding funds may not be that big a stumbling block.